This is the beginning of a series in which I give the blueprint for my Mac Media Server. These pages will be updated with new software and settings changes so they will always be up to date with my current configuration. This is the first part of the series which describes the process of setting up a Mac for remote use. The main goal in this setup is to have as little hardware as possible carry as much of the load as possible. One machine and a couple of USB dongles is the heart of the entire setup. There’s no need for a display, keyboard, and mouse to be connected to the Mac mini because (aside from the initial setup )all of the interaction with the machine will take place over Screen Sharing or VNC. I used the old wired keyboard and mouse that came with my iMac and connected the Mac mini to my HDTV in the living room using an HDMI cable. The setup process is painless — it asks you for your Apple ID, registration information, whether or not you want to use Migration Assistant to move your data, and it also asks you to create a new user account. I skipped migration assistant because I wanted the Mac mini to be a clean slate that I can customize and add data to in my own way. The first thing I did once I got Mountain Lion up and running was turn on Screen Sharing. 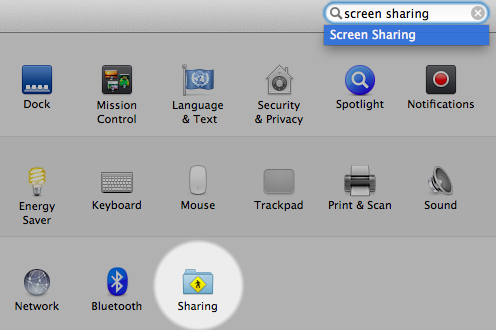 Open System Preferences and click on Sharing. Just check the box next Screen Sharing on the left hand side of the preference pane and you’re finished. With Screen Sharing turned on I can now control the Mac mini remotely using another Mac. At this point I shutdown the computer, disconnected the HDMI cable, keyboard, and mouse and moved the Mac mini into the office where I keep my cable modem, router, and printer. I connected the Mac mini to my Time Capsule with an ethernet cable, plugged in the power cable and it was ready to continue software installation and configuration remotely. Now that Screen Sharing is turned on, it’s time to use it. From my iMac or MacBook Air I open a Finder window click on the Mac mini in Finder’s sidebar and choose Share Screen along the top. The first time I connected, I was prompted for my login credentials, but checking “Remember this password on my keychain” will bypass the login on all subsequent connections. Now, I can perform any action on the Mac mini that I need to from any other Mac in the house. This is essential because a large portion of my media consumption will require me to manually move files around, convert videos, and delete watched content. I hope that I will be able to automate more of this in the future, but for now Screen Sharing will have to do. If you’d like to connect to your Mac Media Server remotely using another Mac make sure you have Back to My Mac turned on in the iCloud settings (located in System Preferences) on both Macs. My other means of controlling the Mac mini is with a wonderful iOS application called Screens ($9.99 but worth it). The app allows me to do everything that I can with Mac OS X’s built-in Screen Sharing, but from my iPhone or iPad. If you’d like to connect to the Mac while you are on a different network you’ll need to do some tinkering. Luckily, I use a Time Capsule in my network setup, so the extra tinkering won’t be too painful. 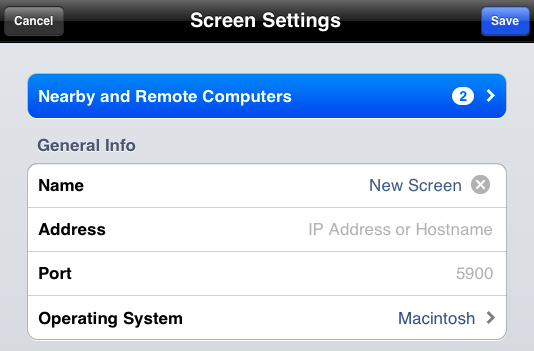 Once the settings are updated you’ll be able to setup Screens on the iPhone or iPad to connect to your Mac remotely. The next piece of information you’ll need is your public IP address. You’ll be able to find it on a site like IP Chicken. Keep your public IP address handy because you’ll need it to setup the remote connection with Screens. In Screens tap the New Screen button in the top-right corner to add a new connection. Input a name for your connection, type the public IP address in the Address field, input the username and password of the Mac OS user account you’ll use to connect to your Mac and tap Save. The connection should now be ready. Previous: Vesper. Collect your thoughts.